FIVE MEN WHO HAVE BEEN PROMINENT THROUGH TWO DECADES. How They Looked at the Beginning of the Seventies and How They Look Now. Heroes of the Forum, the Study, the Stage and the Frontier. When added years bring added honor, and when the crown of silver hair is a crown indeed, it must delight the aged sage or statesman, as well as the man of affairs, to look back to the days when the first triumph was scored in life's battle, and to recall again the blood tingling exultation with which the first shout of popular approval fell upon young manhood's eager ear. The laurel may have wreathed the brow amid the shock of battle, the plaudits of the theatre or the calm repose of the library, but the time, the circumstances, the surroundings, can never be forgotten. The years go by. There are other struggles and greater triumphs, but none so sweet as that first success. And as the progress of time indicates the approach of the end of things earthly, the new generation bows in reverence before embodied worth, and delights to pass in review the deeds which have raised the objects of their admiration from the plane of mediocrity to the heights of fame. There are many men who have sustained through years of labor the promise of their youth and won both honor and fortune by the trained use of exceptional talents. To display and illustrate the upward progress of a few among the many, and to indicate where they stand now and where they stood a score of years ago, is the object of this article. William Maxwell Evarts had already achieved eminence in 1870. As the leading counsel for President Johnson in the impeachment trial, and later as attorney [illustration] WILLIAM M. EVARTS general of the United States, his name came prominently before the people about that time, and as a lawyer and a politician he has held a high place ever after. Since then he has played many parts on life's stage. In 1872 he was counsel for the United States in the tribunal of arbitration on the Alabama claims at Geneva. He next attracted public interest when he appeared as leading legal adviser to Henry Ward Beecher in the suit brought against the celebrated divine by Theodore Tilton. He also argued the Republican side of the electoral case before the commission, and when Mr. Hayes succeeded to the presidency Mr. Evarts became secretary of state. Now, at the age of 72, he is United States senator from New York. Small in stature and apparently feeble, he still possesses tremendous mental energy, and is as eloquent as in the days when he pleaded the great causes that made him famous. He might almost be called the Warwick of the States, for he saved Andrew Johnson from impeachment and secured Hayes in the title to his seat. As noted above, both those presidents rewarded him amply. Tommaso Salvini, the Italian tragedian, is younger than at least three of the men mentioned here. He entered on his 61st year Jan. 1, 1890, contented with the laurels he has gained, and willing, from the repose of private life, to watch the onward progress of his handsome and clever son. Twenty years ago Signor Salvini was driving the Madrilese wild with enthusiasm over his acting. It is recorded [illustration] TOMMASO SALVINI that at that time his delineation of the death of Conrad in "La Morte Civile" produced such an impression that the easily roused audience rushed upon the stage to ascertain whether the death was actual or fictitious. Salvini has been a soldier as well as an actor. In 1849 he entered the army of Italian independence, and found valiantly for the defense of his country. After the proclamation of peace he returned to the stage, with which he had been connected from childhood, and made steady progress in public favor. In 1865, at Florence, the sixth centenary of Dante's birthday was celebrated by the production of "Francesca di Rimini," a tragedy founded on an episode in the "Divina Commedia," and Italy's four greatest actors filled the leading roles. One of these was Salvini, the other three being Rossi, Majeroni and Mme. Ristori. Salvini first visited America in 1874, and his artistic methods are familiar to the American theatre goer. He is a man of courteous manners, magnificent physique and distinguished appearance. William F. Cody enjoys a reputation not at all in touch with that earned by the celebrities with whom he is grouped. While Evarts was expounding the law, Homes writing graceful verse, Dana guiding public opinion and Salvini dominating the stage, Buffalo Bill was out on the American frontier, fighting the Indians and aiding to make the country safe for civilization and the farmer. It is a little more than twenty years ago—in the spring of 1868, to be exact—that Cody won his spurs. He was already a noted man; then about 35 years of age, and wore his title of Buffalo Bill because of his unequaled devastation among the American bison, but on the occasion referred to he rose above the level of the ordinary plainsman and Indian fighter. From his headquarters at Hays City Gen. Sheridan sent Cody as guide and scout to Capt. Parker at Fort Larned. In the next three days, as the bearer of dispatches between those points, he per- [illustration] W. F. CODY. formed the feat of covering 355 miles in fifty-eight hours, 35 miles being on foot. This in a hostile Indian country, without a road to follow or a bridge to cross the streams. The self sacrificing spirit and marvelous endurance of Buffalo Bill made so great an impression on Gen. Sheridan that he called the scout to his headquarters and said: "Cody, I appoint you chief of scouts of the command." The writer, when on the frontier, after the Custer massacre, saw an instance of Cody's nerve. A scouting party was riding among the foothills of the Wind River mountains, in Montana. While going through a small defile from its sides came the crack of rifles. Every one seemed paralyzed but Buffalo Bill. "It's death to run; there's a chance in fighting," he cried. "Up with you, boys." And he led the way. A dozen Indians composed the ambuscade. They were "good" Indians when the skirmish ended. The whites lost one man. While in the government service Cody did gallant work until the year subsequent to the Custer massacre saw the hostile Indians subdued. He was long the idol of the frontier, and the enthusiastic cowboys of the Platte elected him to the Nebraska legislature. At present he is displaying his handsome figure and his Wild West show to the nations of Europe. He is a man whom the judgment of future historians will rank with Daniel Boone and Kit Carson as a bulwark of the border. 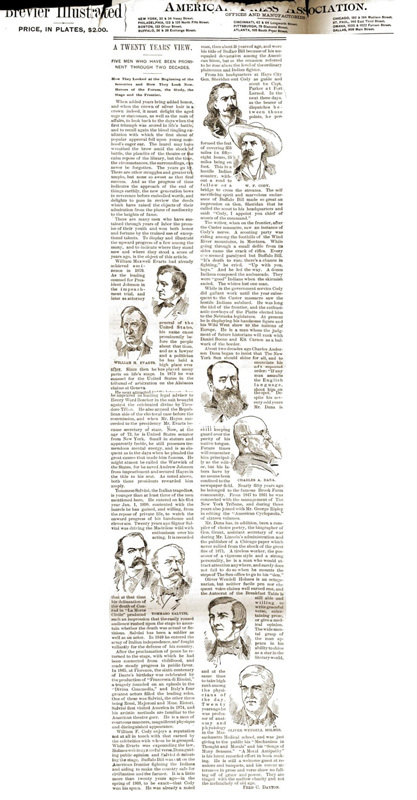 About two decades ago Charles Anderson Dana began to insist that The New York Sun should shine for all, and to enunciate his oft repeated order: "If any man assaults the English language, shoot him on the spot." Despite his seventy odd years Mr. Dana is [illustration] CHARLES A. DANA. still keeping guard over the purity of his native tongue. Future times will remember him principally as the editor, but his labors have by no means been confined to the newspaper field. Nearly fifty years ago he belonged to the famous Brook Farm community. From 1847 to 1861 he was connected with the management of The New York Tribune, and during those years also joined with Mr. George Ripley in editing the "American Cyclopædia," of sixteen volumes. Mr. Dana has, in addition, been a compiler of choice poetry, the biographer of Gen. Grant, assistant secretary of war during Mr. Lincoln's administration and the publisher of a Chicago paper which never rallied from the shock of the great fire of 1871. A tireless worker, the possessor of a vigorous style and a strong personality, he is a man who would attract attention anywhere, and surely does not fail to do so when he mounts the steps of "The Sun office to go to his "den." Oliver Wendell Homes is an octogenarian, but neither facile pen nor eloquent voice claims well earned rest, and the Autocrat of the Breakfast Table is still able and willing to write graceful verse, entertaining prose, or give a medical opinion. The wide mental grasp of the man appears in his ability to shine as a star in the literary world, [illustration] OLIVER WENDELL HOLMES. and at the same time to take high rank among the physicians of the day. Twenty years ago he was professor of anatomy and physiology in the Massachusetts Medical school, and was just giving to the public his "Mechanism in Thought and Morals" and his "Songs of Many Seasons." "A Moral Antipathy" is his latest recorded effort in book making. He is still a welcome guest at reunions and banquets, and his recent utterances in prose and verse show no falling off of grace and power. They are tinged with the mellow charity and not the melancholy of old age.